Let’s get the terminology correct. 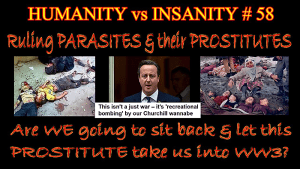 The ‘Bloodlines’ are the Ruling Parasites … Humanity is the ELITE. That’s why they spend Trillions on Vaccines, GMO’S, Fluoridation, Geo-engineering; whilst perpetuating the frauds of Fractional Reserve Banking and Admiralty Law … not to mention maintaining a state of perpetual war … all in the quest to prevent Humanity achieving OUR full potential! TAP – The parasites seem to be thinking about launching nuclear attacks against Putin’s air defence systems. See previous post – at least the threat is implied. How can they back down against Russia after all the rhetoric they’ve splurged in the last fifteen years, yet they don’t have a weapon system other than nuclear which can negotiate Russia’s superior weaponry? Hopefully the Pentagon realises they’ll be first on the Russian counter strike hit list and they decide to pull the nuclear option away from the CIA and the President. This possibly has already occurred according to Gordon Logan, the Captain who refused to pass the codes to the US submarines last March, since disappearing. We have to be grateful to Ian Crane for his non-stop campaigning, his perceptive nomenclature, in which he insists that we stop calling mass murderers an elite. They’re simply thugs, psychopaths who have no compassion for those they destroy. If Ian hadn’t campaigned, I doubt we would have seen off the frackers where we live, which we did during 2015. Let’s look forward to more victories against the Satanists next year. Let’s be grateful to the individuals who put themselves in the way of the Satanic cult that yearns for our destruction and sees themselves as above us all, when in truth they are beneath contempt. They are the very few. They’re prostitutes the 1%. We are the many, the 99%. The elite is the maybe 3% of those who are awake and active. We need many more, which is why we keep blogging.